Julie Retallick has again successfully settled a personal injury case, without the need to issue court proceedings, via the On-line portal for Road Traffic Accidents. This is a claims processing system to deal with all road traffic accidents involving personal injury claims valued between £1,000.00 and £10,000.00 only. It is intended to speed up the process of claiming and Julie uses it to great effect. This claim for personal injury arose following a car travelling at approximately 30/40mph which lost control, mounted a footpath, crossed our Client’s garden and crashed through the front room wall of our Client’s flat where he was sitting on a sofa in the living room. The whole of the car came to rest in the living room before reversing out and driving off. The police and fire services attended the scene. As a result of the accident our Client suffered whiplash to his neck and lower back with a psychological adjustment disorder with anxiety. Julie negotiated settlement of the Client’s damages in the sum of £5,300.00. 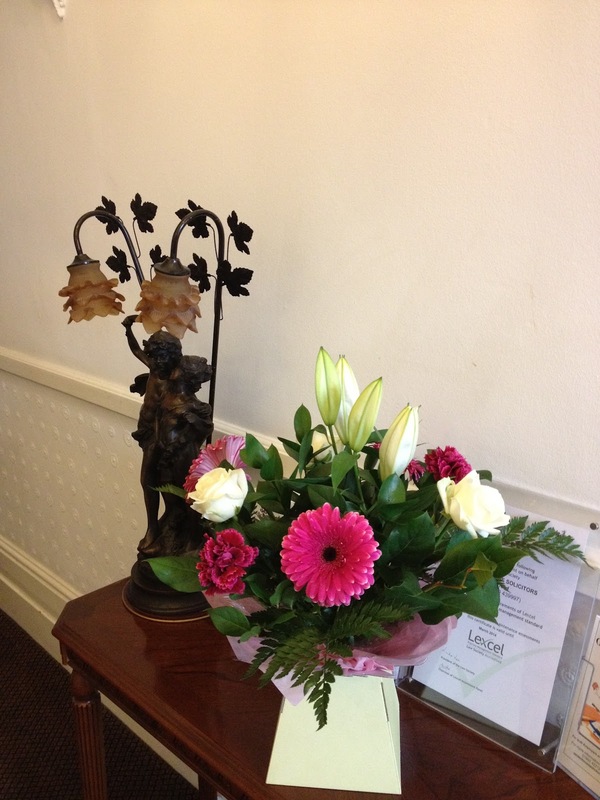 Julie's client was so delighted that she received a lovely bouquet.